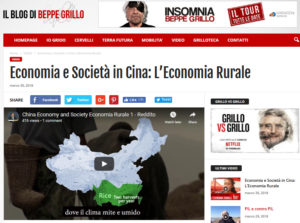 Through this documentary, produced and presented by the economist Michele Geraci, divided into several episodes, we will discover economic and social aspects of this immense nation that runs quickly towards the future. Below is the full text in Italian. 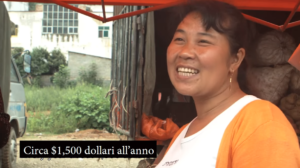 The first episode of the documentary is on the Rural Economy. by Michele Geraci – Perhaps, we have heard about the beautiful villages of China. We certainly know the commercial power of China. Perhaps，we will have seen the modernity of the cities. We know that Shanghai is rapidly becoming an international financial centre and we probably have imagined how China will evolve in the future. However … Maybe … We do not know China at all. Hello everyone and welcome to the first episode of “Economy and Society in China”. We will begin with the first part of this documentary and talk about China’s rural economy. Because to fully understand the Chinese economic development model and the commercial opportunities that this country offers, we first have to understand how rural economy works. And this is true, whether it is done in commerce in the electronics, textiles or other sectors. The complex and related ecosystem of the Chinese economy starts right in the countryside. China’s future growth depends to a large extent on the migratory flow from the countryside to the cities. This provides a contribution to the economic growth of the country. And it is quite natural, that people usually seek a better life, higher wages, better living conditions with access to more services. Over the past 30 years, this model of development has been successful since 1978, when Deng XiaoPing introduced some of the reforms. This has worked so far, but what will happen in the future? Future growth forecasts are based on the assumption that this migration will continue in the future and that around 12 million people a year will migrate from the countryside to the city. But are we sure that this migratory flow will continue in the future? Is this an optimistic forecast? China’s economic growth will face challenges. To answer this question we went to Guizhou, in the southwest part of China. Guizhou is the province with the lowest per capita GDP, $ 2,200 a year compared to Shanghai, which reaches more than $ 10,000 a year (2011 values). But first, let’s briefly review the history of rural reforms. Before 1978 … regardless of the productivity of farmers, their income was limited, so there was no incentive to work harder to produce more. Later with the introduction of the Deng Xiaoping reforms, farmers were allowed to keep production surplus, which could be sold and produce additional income. There is no need for a Nobel Prize to understand that this has completely altered the dynamics of production. One of the most important achievements of these reforms was the dramatic increase in farmers’ incomes. 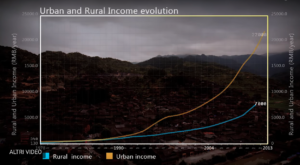 This graph shows the evolution of personal rural and urban income from 1978 until today. In 1978 the average income of a rural resident was only 130 RMB per year, today it has reached RMB 7000 per year an increase of over fifty times. At the same time, the income of the urban citizen increased from 340 RMB in 1978 to more than 22,000 today. I want to divide these thirty years of reforms into three periods: In the first decade, the ratio of urban and rural income decreases significantly, confirming that the first beneficiaries of reforms were indeed farmers. This is the era of Deng Xiaoping, himself a native of a rural area. Later, from 1990 to 2004 economic development. Thereafter, from 1990 to 2004, economic development has shifted from rural to urban development, such as coastal cities. This is the period of Jiang Zemin, a former mayor of Shanghai. Finally, in the last decade, under the guidance of HuJintao and WenJiaBao, who introduced the concept of harmonious society, the relationship between urban-rural income remained stable. Therefore, to predict the evolution of this income inequality, it is sufficient to look at the place of origin of the current leadership. Despite the growing income disparity, there has been an exceptional improvement in the living conditions. Thirty years of reform have lifted four hundred million people from poverty. This is an unprecedented result in the history of mankind. It does not matter what one can think of the Chinese system. China has achieved something that no one else has ever done before. Agriculture remains a very important sector of the economy, contributing 12% to GDP and employing about 25% of the population, about three hundred million people. Naturally, the climate and geography determine which product to grow in a given area. 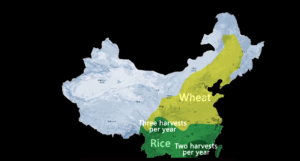 For example, rice is grown mainly in the southern part of China, where the mild and humid climate favours 2/3 crops a year; corn, wheat and soy are normally grown in the north-eastern part of China. Unlike western countries, China’s rural residents face various difficulties, such as, obstacles to the access to credit, land ownership rights and the restrictive presence of the hukou system, which is the residence registration system, that essentially separates citizens into two classes, respectively: rural and urban ones. “About $ 1,500 a year”, “$ 1,500 a year”. The economic condition in rural areas is not so dramatic. Of course, the average income is only a third of the urban one, but there is more. The cost of living in rural areas is only a fraction. Farmers have the use of land which is a fairly stable source of income. The accommodation is free, the food is almost guaranteed by their lands or that of the neighbours. Moreover, even if the work in the fields can be tiring, during the year, only a few weeks are spent in the fields during harvesting and sowing. The rest of the time is spent relaxing enjoying the company of family and friends. In addition, during these periods, if they wish, they can do part-time jobs in local stores or engage in other activities related to agriculture, which would further increase their income. We know therefore that farmers’ income is very low, about $ 1,200 a year, but we also know that a large part of this income comes from other activities such as part-time jobs or payments from family members moving to cities. The actual income, therefore, coming from pure rural activities is $ 500 dollars per year. Working as a farmer is not a very lucrative activity. What can they do to increase their income? Some possibilities could buy better fertilizers, invest in agricultural machinery or progress along the value chain. Instead of growing rice, they could grow peppers or even breed animals. But where do they find the funds to invest? Can micro-credit be the answer? I hope you enjoyed it I invite you to follow the next episode.